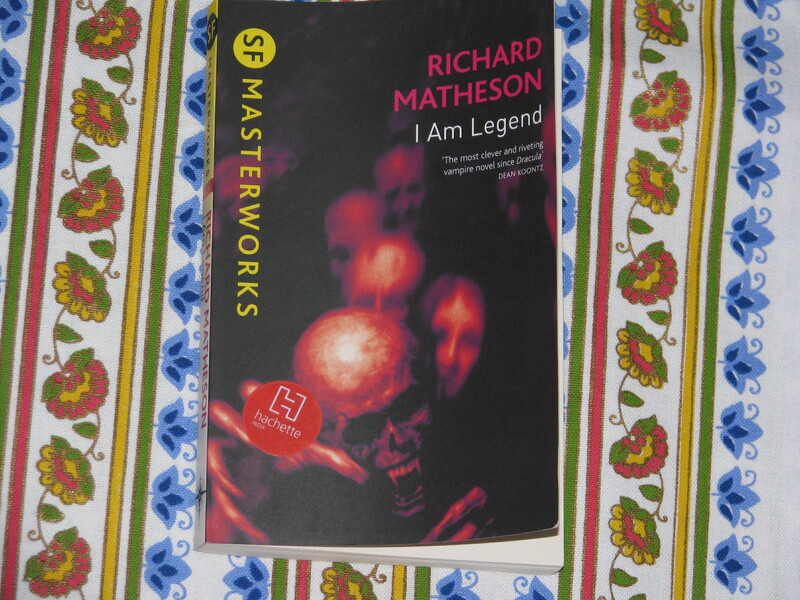 I discovered ‘I Am Legend’ by Richard Matheson during one of my random browsings at the bookstore. At this time, I somehow found myself in front of the shelf which had science fiction books. I found a selection of interesting titles under a collection that the publisher Gollancz had brought out. I sat down in front of the shelf and carefully read the blurb of each of the Gollancz books. Two of them appealed to me and I ended up getting one of them. It was ‘I Am Legend’. Yesterday, I thought that after reading Mary Shelley’s ‘Frankenstein’, I will read one more book as part of my Halloween reads, and so I picked up ‘I Am Legend’. I finished reading it today. Before I get into the review, a few words on Gollancz. Gollancz was one of my favourite publishers when I was younger. The Gollancz logo was quite beautiful – it was a multi-pointed star – and a Gollancz book had a distinctive look – the pages were thick, the font was old-fashioned and it was a pleasure to hold the book, smell the fragrance of the pages and read the old-fashioned font. Unfortunately, Gollancz is no more what it was – it is owned by Hachette now – and from a publishing company, it has been reduced to an imprint. Fortunately, the attractions of a Gollancz book are still there – the multi-pointed star logo still adorns a Gollancz book and the pages are still made of thick paper 🙂 It is sad that these days most of the books that anyone reads in English are published either by Penguin, Random House, Harper Collins or Hachette – atleast the ones I read. Whatever happened to all those small and medium-sized publishers? Do we really want the publishing industry to be so oligarchic? I am giving below the summary of the story as given on the back cover of the book. Robert Neville is the last living man on Earth…but he is not alone. Every other man, woman and child on the planet has become a vampire, and they are hungry for Neville’s blood. By day he is the hunter, stalking the undead through the ruins of civilization. By night, he barricades himself in his home and prays for the dawn. I found ‘I Am Legend’ quite interesting. Though the book is about vampires it was published under a science fiction collection, and so I was curious to know how the two genres were blended in the book. To continue the story in the summary, Robert Neville battles for survival in a world with two species – vampires and humans – with him alone representing the human-side. The vampires try to get at him by night, while he hunts vampires during day. Then he uses reason and tries to find a scientific explanation for the vampiric behaviour of people. He stumbles upon some secrets then. Then he chances upon a real live dog and he is delighted. Then, more surprisingly, he accidentally meets a human being who is alive. He is thrilled. The surprising events which ensue and the twists and turns they go through form the rest of the story. I liked the way Richard Matheson has blended elements of horror, vampire themes and science fiction in his story. To bring a scientific logic into vampirism was something entirely new and unique. I don’t think anyone had done it before him. With his unique perspective, I think he has changed the way we look at vampires. Of course, this change comes with a cost. Vampires in this book are no longer scary as they were in the early vampire novels like ‘Dracula’. But there are twists and turns in the story which bring the scary element in. The ending of the story is quite interesting and brings out a new perspective to the way we look at things. ‘I Am Legend’ has been adapted to the big screen many times – most recently it was made into a movie starring Will Smith. I am hoping to see one of the adaptations. I also read in Wikipedia that Richard Matheson’s novel has the same theme as that of Mary Shelley’s ‘The Last Man’. I found that quite intriguing. I can’t wait to read Mary Shelley’s book now. I am giving below some of my favourite passages from the book (contains spoilers). He had no idea how long he’d been there. After a while, though, even the deepest sorrow faltered, even the most penetrating despair lost its scalpel edge. The flagellant’s curse, he thought, to grow inured even to the whip. His unkempt hair rustled on the pillow as he looked toward the clock. Two in the morning. Two days since he’d buried her. Two eyes looking at the clock, two ears picking up the hum of its electric chronology, two lips pressed together, two hands lying on the bed. After the first few weeks of building up intense hope about the dog, it had slowly dawned on him that intense hope was not the answer and never had been. In a world of monotonous horror there could be no salvation in wild dreaming. Horror he had adjusted to. But monotony was the greater obstacle, and he realized it now, understood it at long last. And understanding it seemed to give him a sort of quite peace, a sense of having spread all the cards on his mental table, examined them, and settled conclusively on the desired hand. Burying the dog had not been the agony he had supposed it would be. In a way, it was almost like burying threadbare hopes and false excitements. From that day on he learned to accept the dungeon he existed in, neither seeking to escape with sudden derring-do nor beating his pate bloody on its walls. And thus resigned, he returned to work. Simplicity had departed; the dream had faded into disturbing complexity. There had been no wondrous embrace, no magic words spoken. Beyond her name he had got nothing from her. Getting her to the house had been a battle. Getting her to enter had been even worse. She had cried and begged him not to kill her. No matter what he said to her, she kept crying and begging. He had visualized something on the order of a Hollywood production; stars in their eyes, entering the house, arms about each other, fade-out. Instead he had been forced to tug and cajole and argue and scold while she held back. The entrance had been less than romantic. He had to drag her in. I enjoyed reading ‘I Am Legend’. Richard Matheson is an interesting new discovery for me and I am hoping to explore more of his books. None of the three feature-film adaptations (THE LAST MAN ON EARTH with Vincent Price, THE OMEGA MAN with Charlton Heston, and the eponymous Will Smith version) truly does the book justice, but the first is by far the most faithful. This is not surprising, since Matheson himself was involved, although he used his pen name of Logan Swanson on the screenplay credit after another scenarist rewrote his work. I AM LEGEND also inspired NIGHT OF THE LIVING DEAD, and was a big influence on Stephen King. For further information, see my book RICHARD MATHESON ON SCREEN (http://www.mcfarlandpub.com/book-2.php?id=978-0-7864-4216-4), now on sale. Thanks for stopping by, Matthew 🙂 It was interesting to read your thoughts on the film adaptations of Richard Matheson’s work. I guess film adaptations of books are never as complex or rich as the book, most times. But I was hoping that one of the film adaptations of ‘I Am Legend’ will come close. I will try to watch the Vincent Price version, because you have said that it is the closest to the book. Thanks for providing me the link to your book which has more information on this topic. I will look for it. I saw the film ‘Duel’ directed by Steven Spielberg yesterday and I discovered that it is also based on a Richard Matheson story. Have you written about this also in your book? I just watched The Last Man on Earth again last night (after re-reading the book last week). I loved Heston’s version growing up in the 70s, but I agree that the Vincent Price version is closer to the novel than Omega Man and far closer than Will Smith’s I Am Legend. Hope you get to read the book and like it, Jo 🙂 I would love to hear your thoughts on it. Appreciate your interest, Vishy. I have indeed written about DUEL in my book, which contains a section devoted to each of the more than 40 feature films, TV-movies and miniseries written by Matheson or based on his work. (Separate sections cover his work as one of the seminal contributors to THE TWILIGHT ZONE, other episodic television, and unproduced scripts.) DUEL was especially important because it was his first TV-movie, a format in which he enjoyed many of his greatest successes of the 1970s, and—as you noted—it marked Spielberg’s feature-length debut. Hope you enjoy the book! But I really like the passages you quoted, and perhaps this story works much better in book format, but I’m now intrigued. Yes, in the book too the main character is the last man and then there is a dog and a lady joins this group later and there is a zombie who also plays an important role. The last man, thinks about his past too and other people come from his past. It sounds like Matheson was the first, but for another book that gives vampires a scientific twist (and with basis on real science at that), I recommend Peeps (Parasite Positive in UK editions – WHY do they change titles again? :P) by Scott Westerfeld. I thought it was a great read. As for I Am Legend. I really need to pick it up one of these days. Hope you get to read this Matheson book and like it, Ana. I would love to hear your thoughts on it. Thanks for recommending ‘Peeps’. I will search for it. ‘Shopclass as Soulcraft – An inquiry into the value of work’. It made me exasperatingly wonder why publishers change titles and why they can’t accept a good title when they see one! Did you ever get around to reading Mary Shelley’s The Last Man? It’s not the easiest read; the first third of the novel is all politics and story set-up, but I think it’s worth it to get through that and see how Shelley depicts the subsequent collapse of civilization. There aren’t a whole lot of true “Apocalyptic” novels out there, most people lump them in with the “Post-Apocalyptic” stuff (sort of a contradiction in terms since the Apocalypse by definition means the end of humanity). Sort of sad, really, since the two novel types are in essence diametrically opposed (as in Apocalypse = we’re all dead, “Post-Apocalypse” = hope for a new civilization). Thanks for writing about Mary Shelley’s ‘The Last Man’. I have it on my ‘To be read’ (TBR) list, but I haven’t read it yet. After reading your thoughts on it, I have moved it to the top of my ‘TBR’ list. I enjoyed reading your thoughts on the difference between ‘Apocalyptic’ and ‘Post-Apocalyptic’. I agree with you that they are two very different things – it is unfortunate that novels of these two types are often lumped together.